The Elves and the Carpenter performed by The Bad Apple Theatre Company at Selston Village Hall was great Christmas entertainment for all the family. Mrs Claus and Mrs Carpenter and two elves took us from the North Pole to Australia and back again – in a sleigh, of course. All the other characters were played by puppets who had accents to match the countries they were in. Audience participation involved providing fuel for the sleigh – Brussel sprouts or stars – what else? The music was good too, especially the song The Elves Have Left the Building which inspired the show. Would you believe that the entire show was performed by just two actresses …… Brilliant! 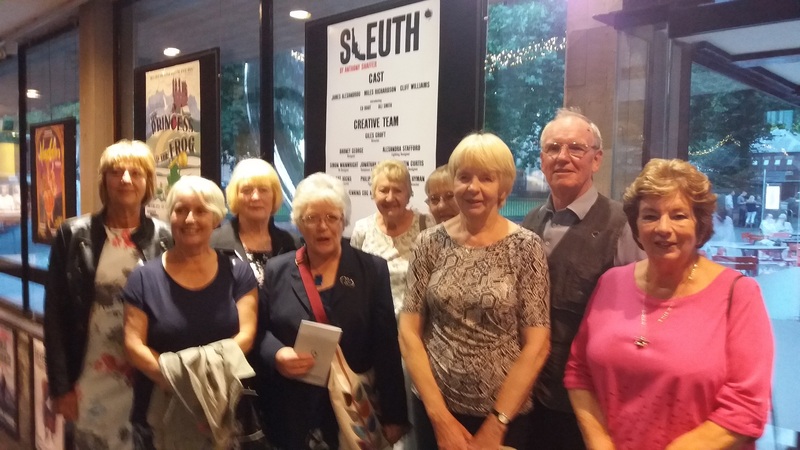 Thirteen members went to the Lace Market Theatre to see this Mike Harding comedy. The Evening Post critic described it: “This is comedy of course, but it suffers from the troublesome flaw of not being funny.” This Theatre Group were also less than impressed. Lovely little theatre though. Very mixed views last night. A slow and flat start spoiled even more by a very loud prompt due to the lead character being deaf ! (sounds funny now I admit). The second half was a lot more lively and funny but the play lacked polish. Everyone loved the old cosy theatre which had very good seating with good views from all seats and a friendly bar. 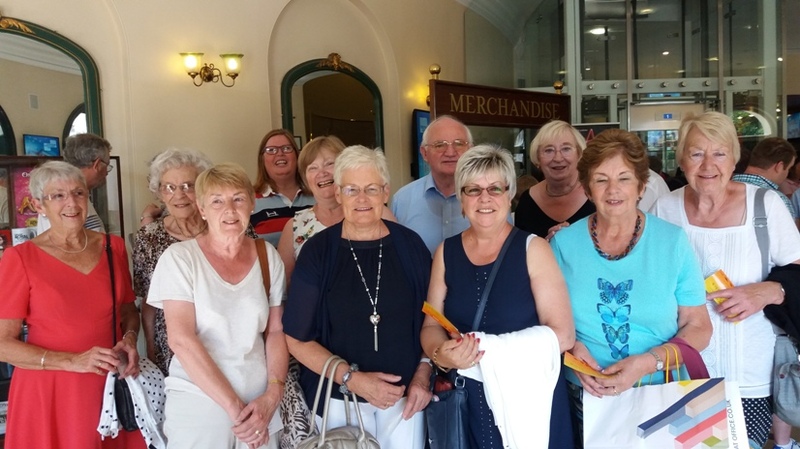 All enjoyed the evening as a whole and discussion continued at the tram stop and on the tram. A night at the Playhouse didn’t have the best start. We booked a pre-show meal which was a disaster. Started ok with the starters then a long wait for the main. Cath didn’t get her main till most of us had finished, by this time it was too late to eat it, the ones that ordered dessert didn’t get them as too late. Some of the food was inedible. Val did a stirling job so we didn’t have to pay for any food. Thank goodness Alladin made up for it. We all enjoyed it and had a good laugh. Left feeling hungry but happy. Oh yes we did. The group attended the Saturday night performance of Footloose presented by the Kimberley based Nowmads group. They put on a sizzling show, all singing, all dancing, full of pizzazz. It had the works including comedy and tragedy. Ren was not looking forward to the move to Bomont and was shocked to find that dancing was banned. A tragedy had occurred 5 years earlier and it was the town councils way to cope but Ren persuaded them otherwise. Rusty stood out for me with her exaggerated moves, a joy to watch. The show really picked up for the second half as the story unfolded. This amateur group gave a very professional performance and should be very proud of their performance. Brilliant fun for Halloween, for rock fans. Some of the audience dressed up. Myself and Val had a great time. Slick, quirky and energetic dance performances took us from the 1950s to the present day. 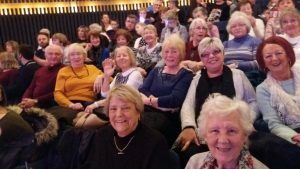 Witty routines, linked to national events and danced to chart hits of the time, created an evening of sheer nostalgia and fun! The fate of legendary bandleader Glenn Miller, remains one of the greatest mysteries of World War II. It is also a mystery as to why 79-year-old Tommy Steele was cast to play 40-year-old Glenn. It pushed the bounds believability too far. However, Steele is still a consummate performer and with his cheeky persona and engaging singing voice, he pulled off a winning performance. The cast was excellent, the band superb and, of course, the music including such hits as Moonlight Serenade, In The Mood and Chattanooga Choo-Choo, was exciting and nostalgic. In all, it was a great production. At the end, as Glenn walked out of the aircraft hangar into an uncertain future, the whole theatre was silently pleading “Please don’t go!” but go he did – and the rest, as they say, is history. A tale of jealousy, humiliation and revenge with lots of twists and turns keeping you on the edge of your seat. The acting was wonderful and the stage settings quite ingenious making this clever play a true delight. Highly recommended. What a fantastic afternoon this was! This was a fun, upbeat show with amazing singing and dancing throughout. Set in the 1960s, I think it brought back memories for us all. With songs like ‘Little Sister’, ‘Sweets for my Sweet’, ‘Then he kissed me’, ‘Can’t get used to losing you’, ‘Please Mr Postman’ and of course ‘Save the last dance for me’ they had us singing in our seats. Here’s most of us in the theatre foyer waiting to go in. Only a few of our group went along to see this story of the Beatles, but they were Glad All Over. It was a Magical Mystery Tour of all their best songs; a real Good Day Sunshine. This musical may have been running since the 1950s but it’s still wonderful to watch. Songs like ‘Luck be a Lady’ and ‘Sit down, you’re rocking the boat’ are classics and the cast delivered them brilliantly. Our first theatre visit, taking advantage of the Playhouse’s Hothouse scheme which we’ve joined. Tickets were just £7. The play itself was extremely funny, with sign language and subtitles used brilliantly throughout, and superb acting. Everyone who went had a great time.